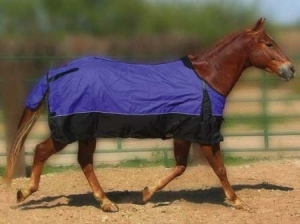 Your Horse deserves only the best Horse Nylon Turnout Sheets. We are confident that the Equine Turnout Sheet selection we have available are sure to satisfy you. This High Spirit Nylon Turnout Sheet has two snap closures at the chest as well as a 2" nylon surcingle belly strap. All straps are integrated into the blanket with optional D rings on top for a hood. Finding the perfect Equine Turnout Sheets can be very hectic and time consuming. This is why we strive to offer only exceptional quality products that we believe are made of unsurpassable craftsmanship.